Go all out with food preps. Potato salad, grapes, cheese and crackers, sandwiches, cold cuts, pastries, baked goods, barbecue, burgers, fruit salad, and drinks like Del Monte 100% Pineapple Juice and Del Monte Fit 'n Right are sure to leave everyone's tummies happy and content. 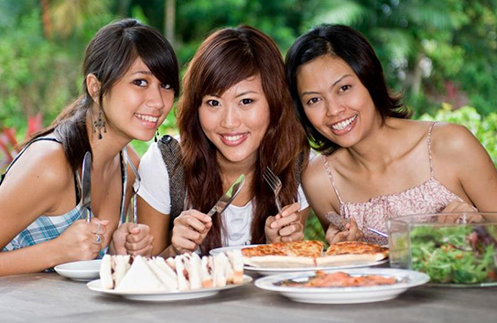 To make the barkada picnic more fun for everyone give it a twist by assigning a theme. For instance, you can assign a color for the week and everyone has to bring food of that color. You can also use different cuisines such as Mexican Japanese Chinese Persian etc. The one who brings the yummiest or coolest contribution can even get to choose the theme for your next barkada picnic. Bring a Frisbee, play tag in the field, do truth or dare, or take some classic board games like Scrabble, Clue, Trivial Pursuit, Pictionary, and Guesstures. You can also bring a deck of cards. The important thing is to bring something everyone would enjoy. Can't wait? Why don't you call up your best buds now and get started on your weekend plans? Throw in these suggestions and see who’s game for some great food and a grand time!